It consists of a complete steel framed building system, with pre-designed components to best suit the unique customer requirements of Pre Engineered Steel Buildings in India. 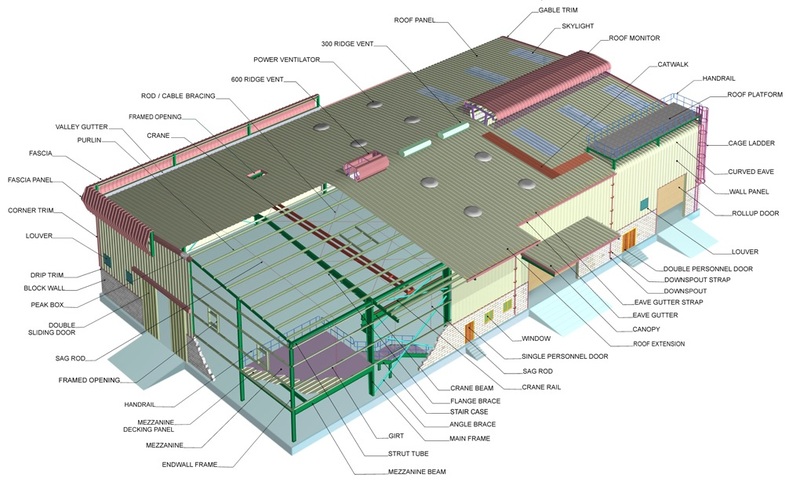 The final product is a complete building shell with substructural systems including mezzanine floors, crane systems, canopies, fascias and interior partitions. Pre Engineered Steel Building System is since long a standard in commercial and industrial market segments such as warehouses, distribution centers and industrial facilities, are continuing to make greater inroads into the low-rise sophisticated building market. Commercial office buildings and mixed use facilities. Institutional and governmental constructions are some of the areas where Pre Engineered steel building systems are being used more and more. These buildings are increasingly recognized as reliable, aesthetically pleasing, energy efficient and cost-effective building alternatives. Structural Base Material All primary & secondary steel used by MBS has minimum yield strength of 50 KSI (345 N/mm2). In 90% of the cases the primary and secondary steel used has minimum yield strength of 36 KSI (250 N/mm2). Foundation Simple design easy to construct and light weight Extensive heavy foundations required. Delivery Average 6 to 8 weeks. Average 5 to 6 months. Cladding and all accessories, including erection if required, all from one source of supply. Many source of supply. Project Management time required to coordinate suppliers and sub-contractors. Structure Weight About 30% lighter through the-efficient use of steel. Primary framing members are (varying depth) tapered built-up plate sections with large depths in the areas of highest stress. Secondary members are light gage (light weight) cold formed (low labor cost) “Z” – or “C” shaped members. Z purlins / girts can be lapped. Lapping reduces the deflection, and allows double thickness at the points of higher stresses (support points). Primary steel members are selected from standard hot rolled “I” sections, which in many cases are heavier than what is actually required by – design. Members have constant cross-sections along the entire span, regardless of local stress magnitude. Secondary members are selected from standard hot rolled ‘I” and “C” sections, which again are much heavier than required. Design Quick and efficient since standardization of P.E.B. has significantly reduced design time. Each conventional steel structure is designed from scratch by the Consultant, with fewer design aids available to the Engineer.. Maximum engineering required on every project. Accessories Windows, Doors, Ventilation etc. Designed to fit the system, with standardized, interchangeable parts, including pre-designed flashing and trims. Mass produced for economy. All available with the building. Every project requires special design for accessories and special sourcing for each. Flashing and trims must be uniquely designed and fabricated. Erection Easy, fast, step by step. Erection costs & time are accurately known, based upon extensive experience with similar buildings. Slow, extensive field labor required. Typically 20% more expensive than a normal PEB building. In most of the cases, the erection costs and time are not estimated accurately. Overall Price Price per square meter may be as much as 30% lower than conventional steel. High price per square meter. Changes Very flexible, tailor made, accepts changes and revisions easily. Future expansion is simple, easy and cost effective. One supplier to co-ordinate changes. Changes, revisions & additions can be difficult due to extensive redesign and co-ordination among suppliers and sub contractors. Built Up – MBS use high grade steel plates conforming to ASTM A572M Grade 345 Type 1 (Minimum Yield Strength is 345 N/mm2). 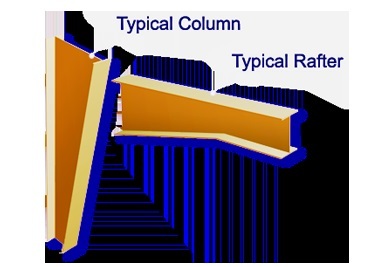 The advantage of using a built-up section as compared to a hot rolled profile section is, these can be profiled into a tapered member to cater for the stress concentration in a building. Hot Rolled – These are the general hot-rolled profiled sections available in the steel market conforming to various international standards. MBS applies some minimum hot rolled sections for use as endwall columns, fascia post, brackets, canopy framing, crane cap channel, stair stringers, strut tubes, mezzanine columns and angle bracing. The grade conforms as given below for different profiles. Purlins & Girts are available in 1.5 mm, 1.8 mm, 2.0 mm and 2.5 mm thicknesses Pre-Galvanised steel coil conforming to ASTM A653M, SS Grade 340 Class 1, Zinc coating to Z275 g/m2 total coating both sides. Champion Prefabs supplies Trapezoidal Profiled Roofing sheets in Bare Galvalume / Colour Coated Galvalume / Colour Coated Galvanized Steel with thickness ranging from 0.47mm to 0.6 mm. Profiles are supplied in exact cut to length up to 12 meters as per customer’s requirement. 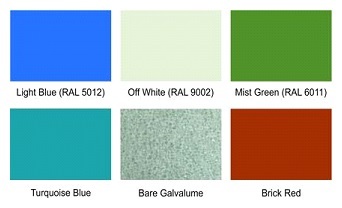 The single skin profiled sheets are ideal for agricultural, commercial and industrial buildings. Polyurethane sandwich panels, single skin sheets and trims/flashings offers complete solutions for all cladding needs.